It starts getting cooler here today, it is cloudy, a little rain here and there. Looks gloomy outside, the color just reminding me of a bowl of mushroom risotto. So I decided to make them. My boys are still sleeping, but worry not, instant pot will keep it warm for them. If you are too scared to use your instant pot, you are surely missing the fun! 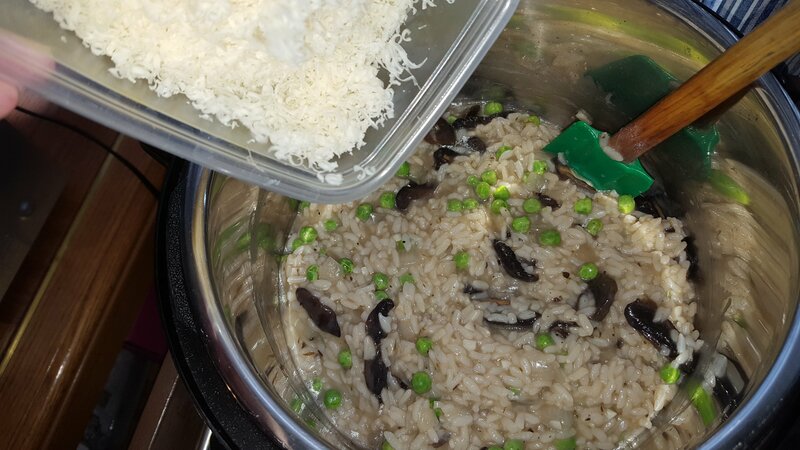 Who like risotto but too scared to make it yourself? Yes those smooth creamy yummy rice that even on food network, some of those chefs failed to make? Not anymore, not with the instant pot help. I wish you are here to smell and taste it. I just love stirring them and feel how smooth and creamy and smelling those subtle thyme, the asiago cheese and the white wine, mannnnn!!!! It is heaven in a bowl…or pot. And it takes 9 minutes cooking while you do other stuffs, like catching up with your series or just back to work..nah. All I did was, of course get all ingredients ready, remember chef Anne said mise en place is important 🤣🤣🤣. Washed and sliced 1 packed of my baby bella mushroom, discard the stem. A stick of butter, now that makes me Paula Deen won’t it? 4 to 5 cups chicken broth, cartoon or homemade. I did homemade, which made in instant pot also. 1 cup white wine, drink the rest. Sautee the onion, mushroom, garlic with 1/2 stick of butter until onion translucent, add thyme, salt and pepper, then add 1/4 white wine to deglaze the pan. Add arborio rice, stir until mix well with the mushroom and onion. Add the remaining of white wine, stir and add the 4 cups of broth. Turn of the pot, closed the lid, and sealed the vent, press manual 9 minutes and walk away. You can watch your movie or grate your cheese while waiting. When it beeped, turn the pot off,release the pressure little by little so it won’t squirt, remember starch and dairy do that when pressure being release. 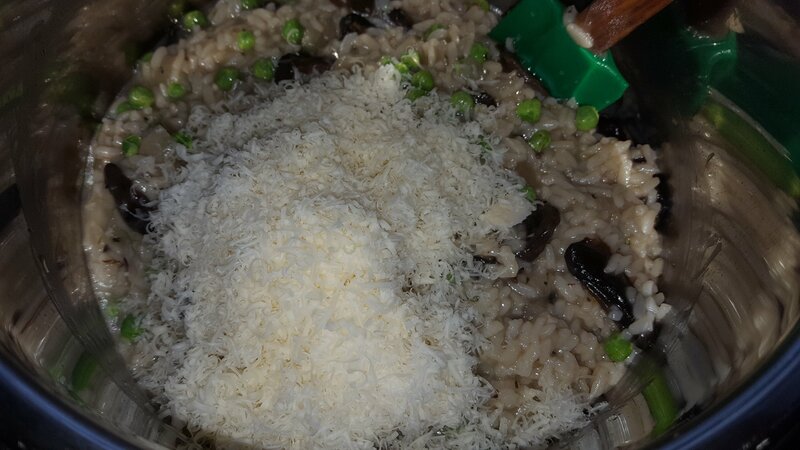 When all pressure down, open the lid, add 1 more cup of broth and the peas and asiago cheese. Stir and serve or leave them in the pot closed, it will keep them warm for hours. See what I am talking about?